Toulouse is the headquarters of the world’s largest aviation industry Airbus and one of the largest cities in France. It is located amidst the scenic backdrop of the Pyrenees. With a host of cultural places to visit, trekking and hiking trails and museums in its midst, Toulouse offers you the perfect chance to delve deep into French culture. With our elaborate car hire services that take you to every nook and corner of the city, you can do just that – with panache! The Cathedral of St Etienne is a popular attraction. Though this architectural wonder took a long time to be built, the elegance and majesty that the Cathedral exudes cannot be missed. Catholic or not, a visit to this ornately decorated cathedral with its mosaics, murals and fascinating gardens is a must. The nave is a beautiful structure and the bell is a gothic replica from the 13th century. This beautiful church, located outside the city, was once a Benedictine convent, however, it gradually became a masterpiece Basilica with different storeys decorated in different ways – the first few storeys have rounded windows, the next few have pointed ones. The towers are painted red and white and against the backdrop of the hills, the Basilica looks simply marvellous. Car rental can take you around several popular areas of the city where you can make the most of similar attractions. Constructed in the 19th century to store water and withstand its tremendous pressure, the Water Tower is one of the popular vantage points in the vicinity of Toulouse, at Pont Neuf. 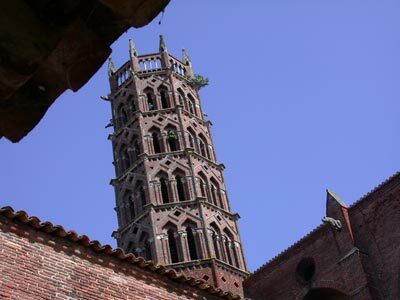 You can catch a bird’s eye view of the surrounding countryside and the Toulouse skyline from the Tower’s highest point. Today the Water Tower, devoid of water, is a photography gallery and is used for small-scale exhibitions. Thanks to its reputation as the headquarters of Airbus, Toulouse has a major piece of land dedicated to the Space City project, completed very recently. The Space City has miniature models of the Mir Space Station and many simulation flights as joyrides for you to enjoy. There are many space museums in the vicinity too. If you plan to learn more about space sciences in Toulouse, a visit to the Space City is so much easier with Toulouse car hire. Toulouse has many more attractions such as the City Park, the Augustine Museum and the Fondation of Bemberg monument. For imbibing the Toulouse French culture and visiting the prime places in the city, Toulouse car rental is perfect. Last month, the average car rental length at Toulouse Airport was 8 days. The average rental car length at Toulouse Airport is 7 days. The most booked rental car type currently at Toulouse Airport is MINI cars. Last year, the most booked rental car type at Toulouse Airport were MINI cars. How much does it cost to rent a car at Toulouse Airport? Last month, the average car rental price was 144 USD. Last year, how much did it cost to rent a car at Toulouse Airport? Last year, the average car rental price was 233 USD. What is the current average daily price to rent a at Toulouse Airport? Last month, the average rental price was 18 USD per day. How much did it cost to rent a car at Toulouse Airport over the past 12 months? Last Year, the average rental price was 34 USD per day. The car rental companies available at Toulouse Airport are: Alamo, National, Enterprise, Firefly, Interrent. See below last 5 customer reviews. Our customers rated Toulouse Car Rental with an average of 10.00 based on 1 ratings. Easy to find, quick service - we were on the road within 5 mins.rneven had a brand new car!